This investment in Guyana acknowledges their evolution and importance to Qualfon’s mission to be the best BPO and affirms our commitment to make people’s lives better. Qualfon, a mission-driven business process outsourcing (BPO) company and global provider of contact center services, announced today that it will transition its Guyana contact center operations, currently located at Beterverwagting East Coast Demerara, to the company’s newly built contact center campus at Providence East Bank Demerara. The transition is tentatively scheduled for August 2016 and will not impact client services or personnel. The Beterverwagting office building, known as Site I, has roughly 500 employees and has served Qualfon since 2005. 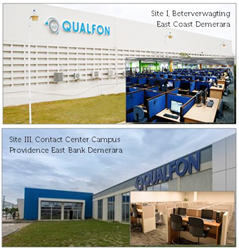 With steady company growth, Qualfon started building new contact center sites in 2013, including Site II located at Goodverwagting East Coast Demerara and the 10-acre Providence campus, which serves as home to Site III (opened in March 2015) and Site IV (currently under construction). “Now that we have the campus, Qualfon is transitioning our employees and client operations to locations where they can be better served and have equal opportunities when compared to our other sites. It’s a true upgrade and marked progress for Qualfon employees and clients alike,” added Yanez. While the new contact centers create first-class working environments, Qualfon Guyana leaders recognize that its strategic plan to invest in infrastructure and raise standards may also cause hardships on employees, such as increased commute times. “We’re working with our employees to understand how transitioning to the campus will affect them, so Qualfon can put a plan in place to address and mitigate any negative impact,” said Alejandro Sotelo Sanchez, Chief People Officer, Qualfon. The Qualfon Guyana Human Development and Mission Office teams created an employee survey and interactive online forum to help identify employee concerns and incorporate their personal needs into the overall transition plan. “Following our company mission, Qualfon wants to take responsibility for our business and for the impact our decisions have on our people. We see this transition as an opportunity to make 500 lives better. We’re working hard to ensure that this transition is just that,” added Sotelo Sanchez.